CARPE DIEM: NYC Taxi Medallions Approach $1 Million!! NYC Taxi Medallions Approach $1 Million!! The price of a New York City taxi medallion (the "priciest piece of aluminum in NYC") that allows a corporate owner to operate a single taxi in the Big Apple is approaching $1 million. 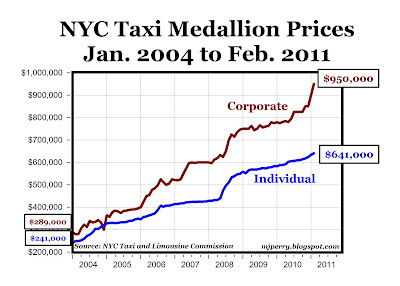 According to the New York City Taxi and Limousine Commission, four corporate taxi medallions sold in February at an average price of $950,000, setting a new all-time high record (see chart above). Twenty individual taxi medallions were sold in February at an average price of "only" $641,000, which also sets a new record high for that category. 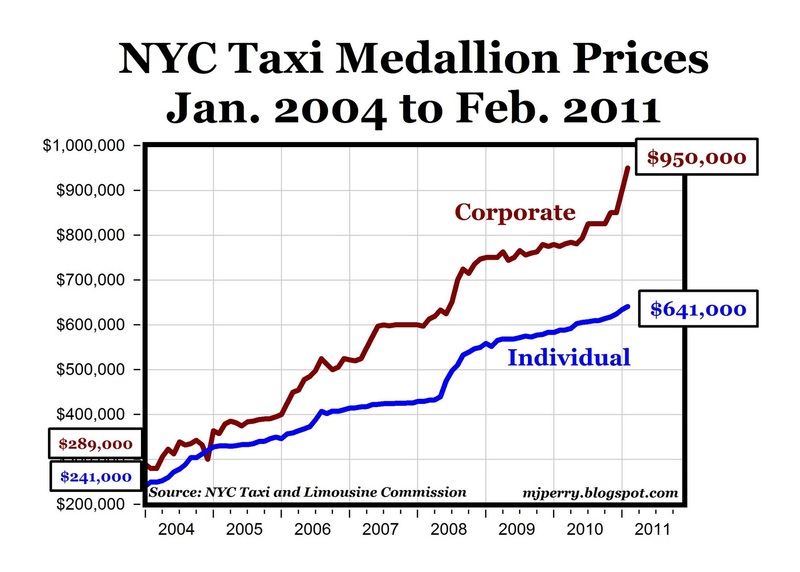 See previous CD posts on taxi medallions and the NYC "taxi cartel" here and here. The most econimically repressive governments in America? Your local town hall, or state government. You can't develop a sky-rise condo in Newport Beach, CA. You can't drive a jitney in NYC. You can't run a push-cart food stand almost any city in America. You can't drill for oil off the coast of Florida, thanks to former Gubbie Jeb Bush. Impediments to growth and job creation? Right in your own City Hall, right among your own fellow citizens. Ben is right on repressive government. As far as medallions go, look at it this way: only the best run cabs can afford that price, all the hacks get weeded out. I prefer to look at it this way. That million dollars is overhead that has to be paid for by customers. Yes, the carrying cost for the medallion has to be paid for. Higher fares, less amenities in the cabs. only the best run cabs can afford that price, all the hacks get weeded out. Another way to look at that is that only those that concentrate on serving the upper middle and upper class can survive, as it becomes unprofitable to serve the poor. "As far as medallions go, look at it this way: only the best run cabs can afford that price, all the hacks get weeded out." So, the way to improve cab service is to artificially force the price higher? Higher price = more value to the customer, right? This has the additional benefit of preventing pesky new entrants to the business. Only existing, successful companies can operate, free of the threat of real competition. The real question is, how hard is it to find a cab in NYC? While I think $950K for a taxi medallion is ludicrous (wouldn't it take a lifetime of fares to pay that back??). I'm also not sure I could recommend just letting anyone operate a taxi. Cities have finite space, and when the streets are wall-to-wall cars, everybody loses (I have seen this in happen in Hong Kong and Seoul). There must be some sort of compromise solution. I'm guessing that we will see a robust industry in making fake medallions (if it already isn't happening). The New Affirmative Action.... for White Males?